Home to one of the oldest and most influential civilizations on the planet, Egypt is a treasure trove of history and culture. 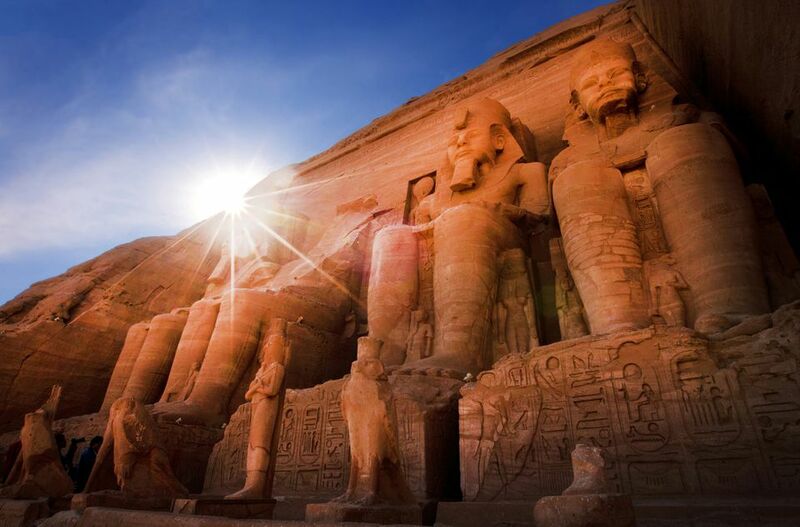 From the capital of Cairo to the Nile Delta, the country is home to iconic ancient sights including the Pyramids of Giza and the temples of Abu Simbel. Additionally, Egypt's Red Sea coast offers ample opportunities for relaxing, swimming and scuba diving on some of the world's most pristine coral reefs. Note: Tourist safety in Egypt can be a concern. Please check travel warnings carefully before booking your trip. Egypt occupies the northeast corner of the African continent. It is bordered by the Mediterranean in the north and the Red Sea in the east. It shares land borders with the Gaza Strip, Israel, Libya and the Sudan, and includes the Sinai Peninsula. The latter bridges the gap between Africa and Asia. With a total area of just over 386,600 square miles (1 million square kilometers), Egypt is approximately twice the size of Spain and three times the size of New Mexico. The country has a desert climate, and as such Egyptian weather is generally hot and sunny all year round. During winter (November to January), temperatures are much milder, while summers can be sweltering with temperatures regularly exceeding 104 F/ 40 C. Rainfall is rare in the desert, although Cairo and the Nile Delta see some precipitation in winter. Weather-wise, the best time to travel to Egypt is from October to April, when temperatures are at their most pleasant. However, June and September are good times to travel for out-of-season deals on trips and accommodation—but be prepared for high heat and humidity. If you're traveling to the Red Sea, coastal breezes make the heat bearable even in summer (July to August). According to July 2016 estimates published by the CIA World Factbook, Egypt has a population of just over 94.6 million people. The official language of Egypt is Modern Standard Arabic. Egyptian Arabic is the lingua franca, while the educated classes often speak either English or French as well. Islam is the predominant religion in Egypt, accounting for 90% of the population. Sunni is the most popular denomination amongst Muslims. Christians account for the remaining 10% of the population, with Coptic Orthodox being the primary denomination. Egypt's main gateway is Cairo International Airport (CAI). There are also international hubs in main tourist destinations like Sharm el-Sheikh, Alexandria and Aswan. Most travelers will need a visa to enter Egypt, which can be applied for in advance from your nearest Egyptian embassy. Visitors from the U.S., Canada, Australia, Britain and the EU are eligible for a visa upon arrival at Egyptian airports and the port of Alexandria. Make sure to check up-to-date visa regulations before booking your ticket. Egypt's currency is the Egyptian Pound. Check for up-to-date exchange rates. All travelers to Egypt should ensure that their routine vaccines are up-to-date. Other recommended vaccines include Hepatitis A, Typhoid and Rabies. Yellow Fever is not a problem in Egypt, but those visiting from a Yellow Fever-endemic country must provide proof of vaccination upon arrival. For a full list of recommended vaccines, check the CDC website. Located just outside Cairo, the Pyramids of Giza are arguably the most famous of Egypt's ancient sights. The site comprises the iconic Sphinx and three separate pyramid complexes, each of which houses the burial chamber of a different pharaoh. The largest of the three, the Great Pyramid, is the oldest of the Seven Wonders of the Ancient World. It is also the only one still standing. Frequently referred to as the world's largest open-air museum, the city of Luxor is built upon the site of the ancient capital of Thebes. It is home to two of Egypt's most impressive temple complexes - Karnak and Luxor. On the opposite bank of the Nile lies the Valley of the Kings and the Valley of the Queens, where the ancient royals are buried. Most famously, the necropolis includes the tomb of Tutankhamun. Egypt's Red Sea coast is famous as one of the best scuba diving destinations in the world. With clear, warm waters and an abundance of healthy coral reefs, it's a great place to learn to dive. Even seasoned divers will be thrilled with the region's World War wrecks and bucket list marine species (think sharks, dolphins and manta rays). Top resorts include Sharm el-Sheikh, Hurghada and Marsa Alam.